Chaffee Crossing is one of the nation's premier base redevelopment projects that started with the 1995 Base Realignment And Closure (BRAC). 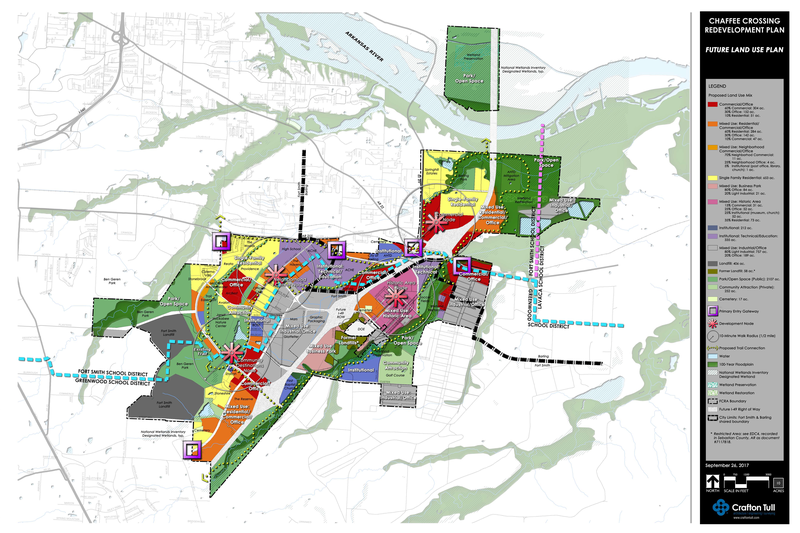 Today, Fort Chaffee Redevelopment Authority's 7,000-acre Master Plan guides development based upon Smart Growth, New Urbanist principles with a goal of making Chaffee Crossing a walkable community that has an overriding quality of life. Workplaces, homes, recreational amenities, trails, shopping, churches and more are all conveniently situated near each other for a complete community within the cities of Fort Smith and Barling, Arkansas (the city limits are indicated by the black dotted line). The property is also within three school districts: Fort Smith Public School District and Greenwood Public School District (separated by the light blue dotted line) and Lavaca Public School District (indicated by the pink dotted line, upper right corner).